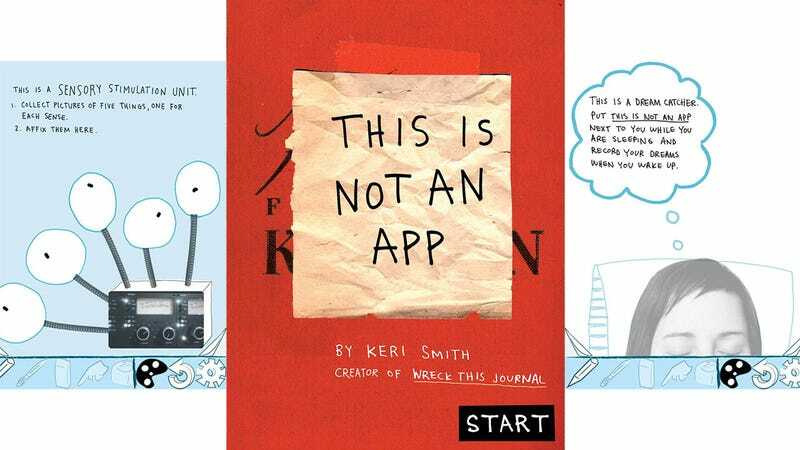 Keri Smith's This is Not an App is, as the title suggests, not an app. It's an interactive exploration of everything an Android or iOS app can be when guided by your hands. Is it a recording device? A secret? A dream journal? A dare? Yes, but it's more than that. Just as Smith's popular This is Not a Book challenges the idea of what a book can be, This is Not an App does the same for mobile applications using a series of interactive journal pages. It's a blank slate ready to accept the dreams, hopes and fears of the user. It's a journal. It's a record of the user's environment and opinion in 50 screens. Filling out the pages is a journey. Sometimes it's sensual, asking the user to collect pictures of objects that stimulate their senses. Once filled, the page becomes a snapshot of touch, sight, smell, taste and sound, a story in five parts of a single moment in the user's life. Another page asks the user to record a single dream. Or tell a secret. Or record the people met over the course of a day. It's not a game, of course, but with the year changing over in a few days this is an excellent time to save a snapshot of who you are, to be pulled out 365 days from now to gain perspective on how large an impact the countless tiny day-to-day changes in our lives really have.